Massimo Lunardon's hand-blown glasses are colorful interpretations of classic Venetian wine glasses. Italian artist Massimo Lunardon creates a colorful interpretation of the classic Venetian wine glass, or goto, with this set of six hand-blown glasses. 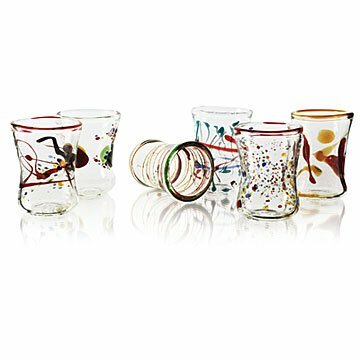 The undulating shape and confetti swirls on these unique tumblers bring fun and personality to any meal or gathering--adding a stylish design touch to a well-dressed table. Sold as a set. Due to the handmade nature of the product, each glass is one-of-a-kind and colors and shape may vary. When Italian artist Massimo Lunardon needs inspiration, he lets his mind and body wander. "I like to get lost in old libraries, walk into local markets, and visit the hidden places of the European capitals," he says, citing Le Marais in Paris and Portobello Road in London. It's this come-what-may attitude that inspires his handcrafted glassware, too, pushing him to play with form and artistic conventions as he envisions a new piece. But once he begins the crafting process, he seeks what he calls a strict symbiosis with what he's making: "When I start to create a new piece, I completely isolate myself from everything that surrounds me," he says. But "the thrill in seeing a new piece take shape" is always worth it. I am a practical person with academic experience in the fine arts and English literature. I do appreciate the shape and the one of a kind designs, colors and composition that these glasses exhibit. I am pleased with my choice. Beautiful glasses, but the price is probably not worth what you get - 25% less expensive would be worth it. Decided to pay the price because I had gift cards accumulating. My sister gave me these glasses two years ago. I love how they fit my hand. It is my favorite wine glass. I liked them so much that I gave them to my brother and his wife for Christmas. Beautiful glasses ... we use them all the time. We received so many compliments from friends and family. The price is not inexpensive and that's the reason why our friends and family have not bought them. For us, it is worth the price. I bought these glasses for myself because I thought they looked interesting and beautiful. The glasses we received look similar to the catalog photo. Nice weight and thickness to the glasses - not too thick and definitely not too thin. I use stemwear when drinking wine and plan on using these as everyday glasswear. The hardest decision will be which gorgeous glass I should pick out of the cupboard that day. I would love a set of these in a larger size. I would buy other products by this designer/maker! I bought these for my mom as a "just because" gift! I wanted to save it for Mother's Day but I couldn't wait. I thought they were really neat. My mom was upset that I bought something since it was shipped to the house and kept complaining about it. So I opened it up to check them out and brought it to her and she LOVED them! They have neat designs and the fact that the colors are all a little different as well as the designs makes them a unique set and they can mix with other colors as well. As far as the dishwasher safe note goes, I assumed it was not safe since it is hand painted, so I do not consider that a con. Other than that, they are great glasses. My mom was proud to clear out our cabinet to make room for them!